Gorgeous, unique, spacious, peaceful home surrounded by a garden with typical Mediterranean plants such as lemon, mandarins, orange, almond, olive, rosemarie, lavender ... Nice view of the sea from the big terrace. Enjoy the fully equipped kitchen, or ask about having a meal delivered to your table (additional cost). The house has every modern convenience - BBQ, DVDs, TV, high-speed WiFi Internet connection. Relax on the most beautiful beaches found anywhere in the world. If you want peace and privacy stay at home and enjoy your private swimming pool with jacuzzi. Two of us stayed 5 nights mid-Sept. Very relaxing. Went up the ladder to rooftop for wide-open views of sky, water, boats, and distant islands. Sunsets supreme, with a few gnats (bug repellent helped). The fruit trees are awesome, and add to the privacy. Rosemary growing on the patio was delicious in our baked chicken. Easy and picturesque 2-hour drive down Highway 8 to Mostar, Bosnia Hercegovenia, a doable day trip. Delicious burger at Clementine’s Pub on the waterfront at Tucepi which is next to Podgora. Also marveled at the tiny church of St George dating from 1311! Liked the quiet, peaceful way people hung out at the water, lying on the small pebbles. Not at all loud, enjoying the clear water, the sun, each other. Croatians appear to be lovers of simple joys. We flew into Split, got groceries at Interspar-City Center Mall there. Thereafter at Lidl in Makarska. Best to get provisions before you get to the house, so you can get on with pure relaxation. House already had nice “little touches” - shampoo, conditioner, body lotion, spices, coffee, plastic wrap, paper products. Just really needed aluminum foil, matches, and olive oil for grilling out (and the bug repellent). We are age 60+, only walked one time down, then back up, the hill taking stone steps into Podgora. Truly hot and exhausted by this, but between the welcoming pool and A/C, recovered nicely. Did not make it to Dubrovnik, but found the coastline south of Podgora absolutely stunning, and wished we’d given it more time. Thanks again for a vrbo that checked the boxes for peace and quiet! neighbouring Islands of Hvar,Brac and Korcula. The villa itself is tastefully decorated inside and very well equipped ( although I found the dishwasher didn’t clean very well) ( owner notified). The beds are really comfortable and there is masses of storage in each of the two bedrooms. Outside there is a lovely large table under cover from the sun with plenty of seating and the pool area is well equipped with plenty of sun beds. The pool is much larger than it looks in the pictures. It is worth noting that there are apartments opposite the villa and a walkway to the beach runs alongside so you are overlooked. However there are blinds by the seating area which is a very clever touch by the owners to minimise the intrusion. The owners are generally good at communicating and very kindly let us swap (at the very last minute due to a family crisis)a week booked last year for this year instead. 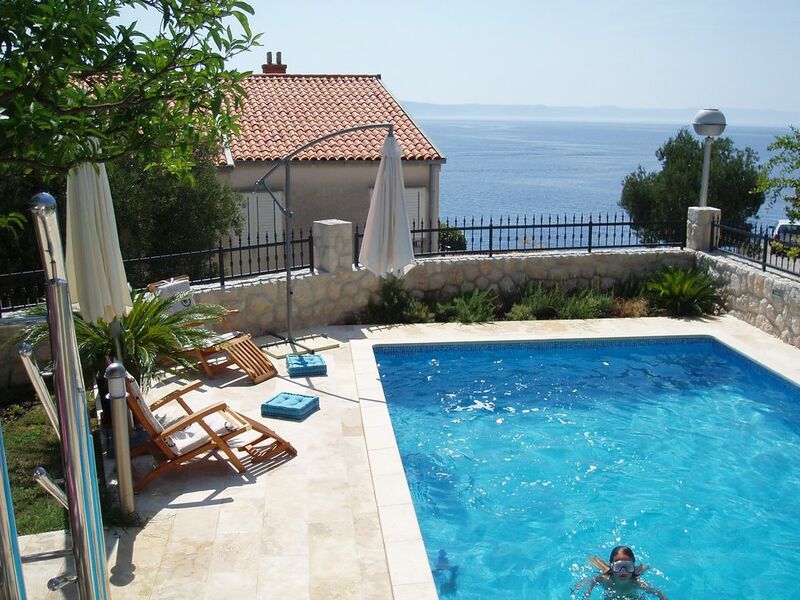 We had a lovely week in Podgora and thoroughly enjoyed our stay at the villa. A stunning property with a panoramic view. We stayed, 2 couples, for 10 days in early sept and were not disappointed. The house is well equipped, comfortable with everything you need in the kitchen and wifi with enough bandwith to stream movies. Great shaded outdoor area for eating. The pictures of the swimming pool don't do it justice. The pool is larger than the pictures suggest and is warm. Great to lie around the pool with a chilled glass of wine. 130ish steps down from peace and tranquility and you arrive at the sea front with shops, restaurants, bars, supermarkets and souvenir shops. You can swim almost any where and it is warm and safe. If you find steps difficult there is a road you can use. A high spec villa in seaside holiday town. A perfect combination for couples and families. Thank you so much Iva, We would love to return. Joe, thank you very much for this beautiful review. I would very much like to welcome you again in Podgora!!! We so enjoyed our week in Iva's lovely villa. It was the most well equipped property we have ever stayed in and the pool and garden were pristine and much larger than in the photos. We had a lovely day in Dubrovnik and also went to Mostar in Bosnia to see the reconstructed bridge, it was a fascinating visit. Podgora itself has something for everyone and it was just a short flight of steps to the restaurants and bars. We saw the most beautiful sunsets every evening too- a perfect stay!! Thank you for the beautiful review. I am realy happy that you enjoyed you stay in my house. Very modern villa exceptionally clean with everything you could possibly need.The pool was just the right temperature and fun with the jacuzzi and tide machine.The outside space was particularly good with a big table and chairs under a canopy to keep you cool in the heat of the midday sun.Location to the beach was a short walk down about 120 steps.The beach had beautiful turquoise water.Plenty of shops and restaurants and various boat trips and watersports.The villa was easy enough to find , about 2 hours driving from Split Airport, also private car parking with security electric gates.Overall I think you couldn't find a better villa in Podgora with a private pool. I spent last week at this amazing villa with 4 friends. From the moment I booked the owner Iva was very quick at answering any questions I had and this continued through out the holiday. Iva even helped our friend book an apartment opposite so she could join us as the villa couldn't accomadate an extra person. The villa has everything you need kitchen is very well equipped with all the essential things. Dishwasher was great we used every day holiday time is precious no body wants to spend it doing the washing up! Plenty of clean towels and even a washing machine which we used also. Everywhere was spotlessly clean. Loads of outdoor space and shaded area with a huge table to eat/drink. The pool was amazing so much bigger than it looks in the photos and the temperature was perfect not too cold! Few minutes down the steps brings you right to the beach, bars, restaurants and shops. Jet skis, para sailing, pedoles etc all available down there. Recommend banana bar best cocktails along the front and also live music. We took a trip out to the waterfalls which was lovely but be prepared it was very busy and we visited Dubrovnik which we loved well worth the the 2 1/2 hr trip. The only thing that could of made it better was air con in bedrooms. It was extremely hot when we were there so we went out and got fans which helped but that really is my only negative comment. This villa is in a fantastic location and we honestly had the best holiday and we will definitely be back!